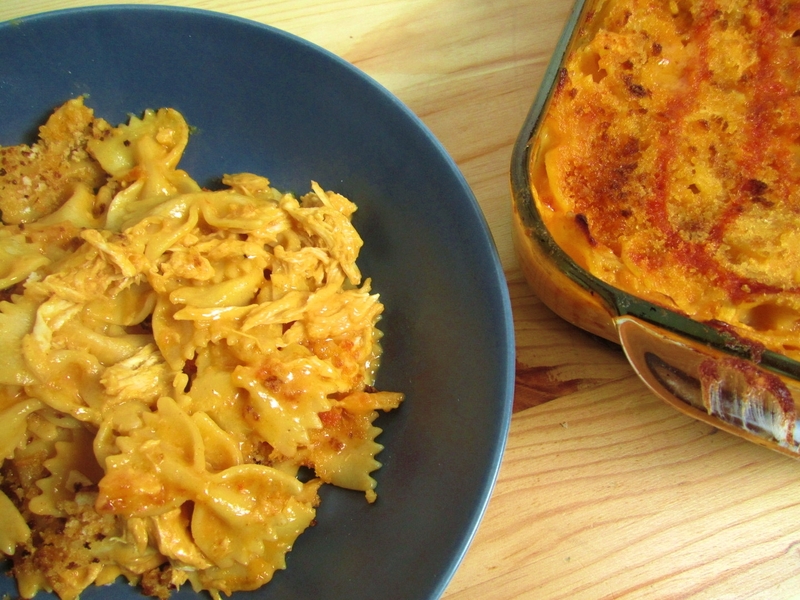 Buffalo Chicken Mac and Cheese - Eat. Drink. Love. If you read my blog regularly, you’ve probably heard me say that my husband is a buffalo chicken fanatic. Buffalo chicken sandwiches, buffalo chicken pizzas, and now, buffalo mac and cheese. I made this dish on the fly one night and it was a total hit with the Hubs. He immediately declared it one of his favorite meals that I have ever made. I was really surprised considering I had no recipe when I made this and wasn’t sure how it would turn out. Now, if you’ve heard me say that my husband is a buffalo chicken fanatic, you’ve also probably heard me say that I am not as big of a fan. It’s not that I hate it, it’s just not my favorite. This mac and cheese was really tasty, but it is rich. 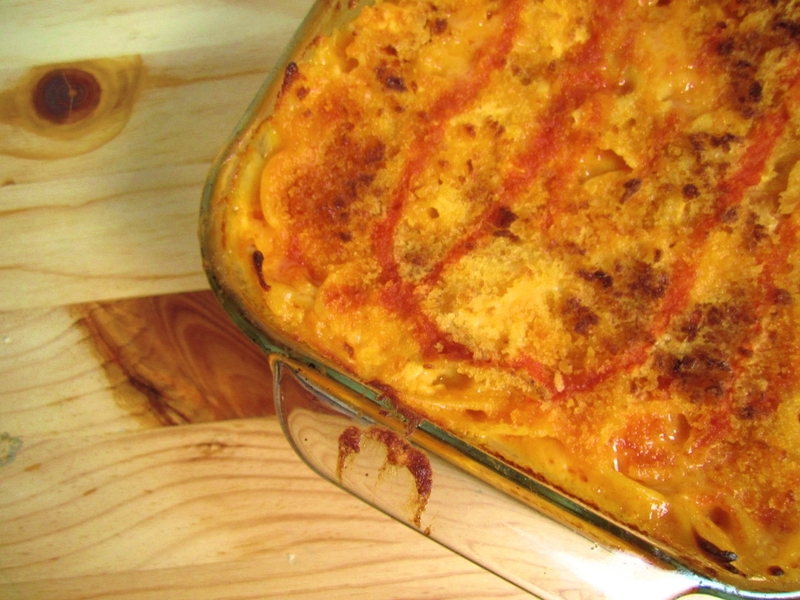 Eat this buffalo mac with caution! For those of you who are little more health-conscious, fear not! I actually prepared myself a low-carb and low-fat pumpkin mac and cheese. I will share that recipe with you next week! Until then, have a great weekend everyone! Oh, and if you have not done so already, please check out my post from earlier this week , The Perfect Tailgate Pasta Salad, I would really appreciate it if you all could check it out as I am trying to help my dear friend raise money by selling awesome pastas for her daughter’s school, The Katzenbach School for the Deaf in New Jersey! 1. Preheat oven to 350 degrees. Cook pasta until it is slightly al dente. While the pasta is cooking, you can start the cheese sauce. In a separate sauce pan, heat the butter on medium heat. Once it is mostly melted, add the flour and stir about 2 minutes. Add the milk and whisk until the flour is broken up. Add the cheddar and mozzarella cheese. Whisk continuously until the cheese is melted. Add 1/2 cup of the buffalo sauce, garlic powder, and salt and pepper to taste. 2. Drain the pasta and add to a baking dish. Add the chicken. Pour the cheese over the sauce and mix until it is fully incorporated with the pasta (you may have a little extra left over, which I did, and just didn’t use). Drizzle the remaining 1/4 cup of the buffalo sauce over the pasta (you can use more if you want). Sprinkle the panko evenly over the top. Cover the baking dish with foil and bake for 30 minutes. Uncover and bake for an additional 5 minutes or until the bread crumbs have browned on top. This is GREAT! We love wings and buffalo chicken….anything, too! Thanks SO much! Buzzed! Thanks for the buzz, Ann! Thank you, Nami! This is a great way to use up extra sauce! 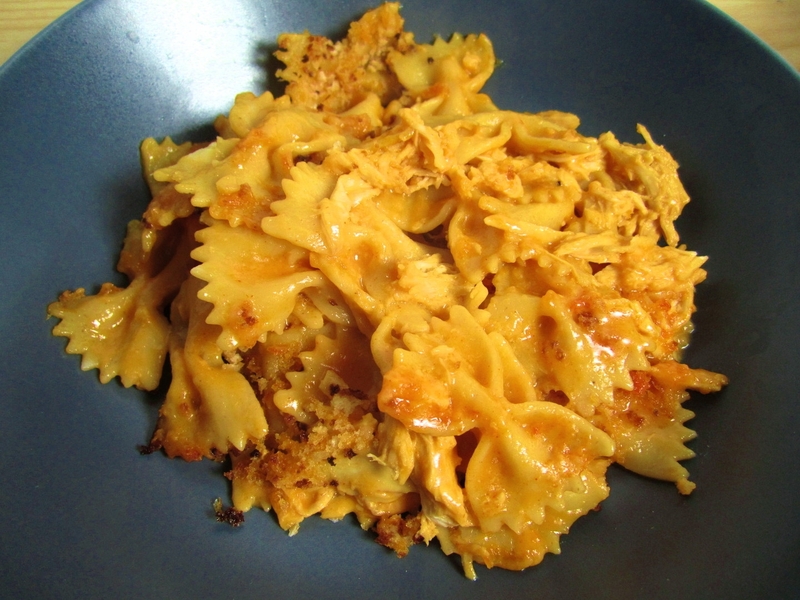 this pasta sound rich and tasty spicy,I like have hot “spicy” taste to it on this mac N cheese,It is great if your experiment turn out really well . Thanks, Ridwan! I like the spicy kick too! I love Frank’s brand! It’s the only one we buy! I’ll post the pumpkin mac and cheese this week! You are coming up with some awesome pasta dishes. This one is a definite winner. Cheesy and spicy-yum! Well done! I love buffalo wings and I love this recipe! I can’t wait to try it! Thanks, Jill! I hope you like it! Now this is my kind of mac and cheese! I loveeeeeeee anything buffalo and definitely love mac and cheese so this goes on my “to try” list. Buzzed! Thank you, Janet!! I hope you like it! Great pasta dish! I have recently just gotten into the buffalo chicken thing thanks to my friends! I’ll be passing along your recipe, looking forward to trying it! Thanks, Meghan! I hope you all enjoy it! We are buffalo lovers. I have made something similar in the past and it’s amazing! This looks fabulous–love that the spice probably cuts through some of the richness of all the cheese. The spice is really nice. My husband even drizzles additional buffalo sauce on top of his! My husband would LOVE this dish. Thanks for sharing the recipe. It will make him one happy man. Thanks, Emily! This is total man food! Oh, my gosh, does this look amazing! Full of spicy, cheesy goodness! So good! This shouts comfort for me, love these combinations of flavors have made a similiar dish, we eat this often yours looks awesome! I agree! Mac and cheese is total comfort food! My husband would probably eat wings every night for dinner if I didn’t cook. I really like this pasta though. It looks so good and anything that’s spicy and cheesy is a winner for me. My husband doesn’t usually like pasta dishes, but I bet he would love this one. Stephanie, buffalo mac n cheese! Wow! This is absolutely gorgeous and so perfect for the winter weather. This is a very dangerous dish for me – I could eat A LOT of it. So I look forward to your lw carb version, because that’s really the only safe one to have around! Yes, this can be so dangerous! Even as a vegetarian, I can appreciate how completely delicious this looks! Had to buzz this one! Love the twist on the old classic. Yum! Thanks for the buzz, Jen! Thank you, Ann! I think buffalo is my husband’s favorite food group as well, lol. OMG. This is like playing to my weak side… Mac & cheese is just one of those irresistible carbs – the ultimate comfort food – AND, the fact that you’ve combined it with some smoking buffalo hot sauce?!! *love* this!! I know what you mean, Kelly. Mac and Cheese is so comforting! My husband would go crazy for the dish – bookmarked! Thank you! Doesn’t this just scream man food?! YUM!!! I am a sucker for all things buffalo! As long as it’s made with Frank’s and not Tabasco. I have a buffalo turkey (chicken could easily be subbed) sandwich on my blog that your hubby might like too! Let me know if you are interested in the recipe. Thanks for sharing this. It looks amazing! I love Frank’s too! I will check out your buffalo recipe! Always great when your husband declares ‘this is the best meal you ever made’!